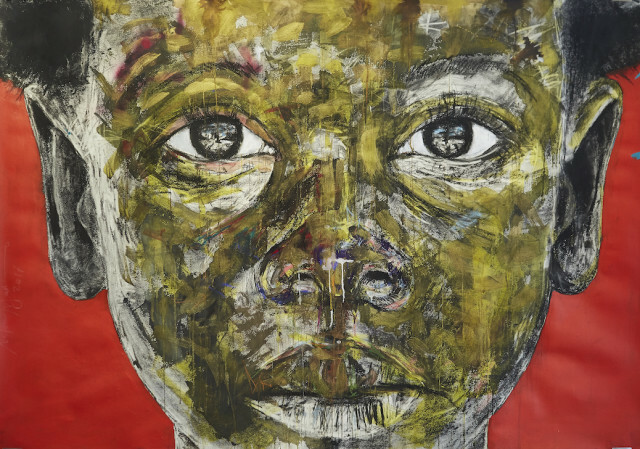 Nelson Makamo's art is primarily focussed on portraiture. Born in Modimolle, Limpopo Province, he studied printmaking for 3 years at the Artist Proof Studios in Joburg. Makamo's work is strongly influenced by the daily life of South Africans, with great emphasis on the portrayal of the innocence of children in the rural areas. Facial expressions, features, emotions, and body language all come to life in his canvas. He works in a variety of media: charcoal, oil paints, watercolour, silkscreen, monotype printing techniques, and pen and ink. Makamo is a storyteller and his works vividly capture the visual representation of his daily encounters, urban city life, personal history/experiences, identity, the transition from childhood to adulthood, and migration. His art is vibrant; it resonates and communicates about the universal experiences of humanity. Makamo works as a full-time artist at his studio in the heart of Joburg - a space he deems to be the most sacred place in the world. Some of his important commissioned works include portraits of ANC stalwarts Oliver Tambo, Walter Sisulu as well as the late great Nelson Mandela himself. And amongst collectors of his work are fashion mogul Giorgio Armani and the music icon Annie Lennox. Now, the London art scene will be introduced to his works.